Tampa, FL – Refinery maintenance season has hit some unexpected bumps in the road, leading to higher pump prices as the nation settles into spring. 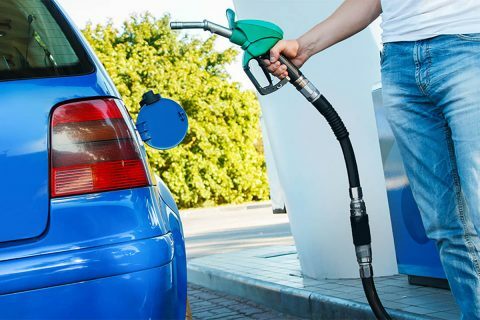 According to new data released from the Energy Information Administration (EIA), total domestic refinery utilization – a measure of how much crude and other feedstocks refineries use to make various products, including gasoline – fell to 86.4 percent last week. Tampa, FL – At $2.74, the national gas price average increased a nickel on the week and is eight cents more than last year at this time. And compared to one month ago, gas prices are 28 cents more expensive. As demand holds steady and inventories continue to tighten, motorists continue to see gas prices increase in every region. 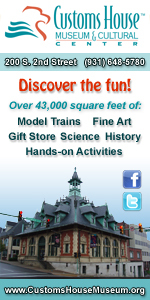 Washington, D.C. – Spring fever may be in the air, but American motorists already have summer road trips top of mind. AAA’s latest Gas Price survey found that if gas prices remain low, 1 in 3 Americans (33 percent) would likely plan another summer road trip while 27 percent would increase the distance of one – with Generation X more likely to do both than Baby Boomers. Tampa, FL – With an eight-cent jump on the week, at $2.62, the national average continues to trend more expensive since mid-February. While today’s national average is nearly a quarter more expensive than last month, it is only two cents more expensive than last year at this time. “Thanks to increasing demand and tightening gasoline stocks across the country, March gas prices came in like a lion and will not go out like a lamb,” said Jeanette Casselano, AAA spokesperson. Tampa, FL – According to AAA At the end of last week, total domestic crude oil inventories rose less than expected – a build of only 1.3 million bbl to total 447.2 million bbl, according to new data from the Energy Information Administration (EIA). The slight build in crude inventories was supported by a sharp drop in demand for gasoline, which fell by approximately 500,000 b/d to 9.1 million b/d, according to EIA. 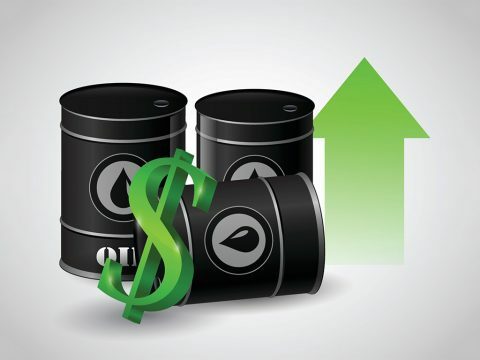 With crude stockpiles growing less than anticipated, crude prices will likely continue to gain ground. AAA reports Higher Oil and Pump Prices Likely Ahead. 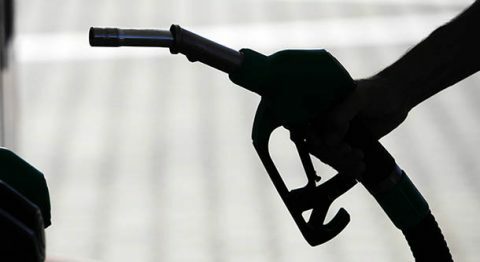 Tampa, FL – Many motorists filling up across the country are noticing gas prices that are increasing slightly. While nearly 25 states’ averages increased on the week, the national average is only a penny more than a week ago at $2.26. 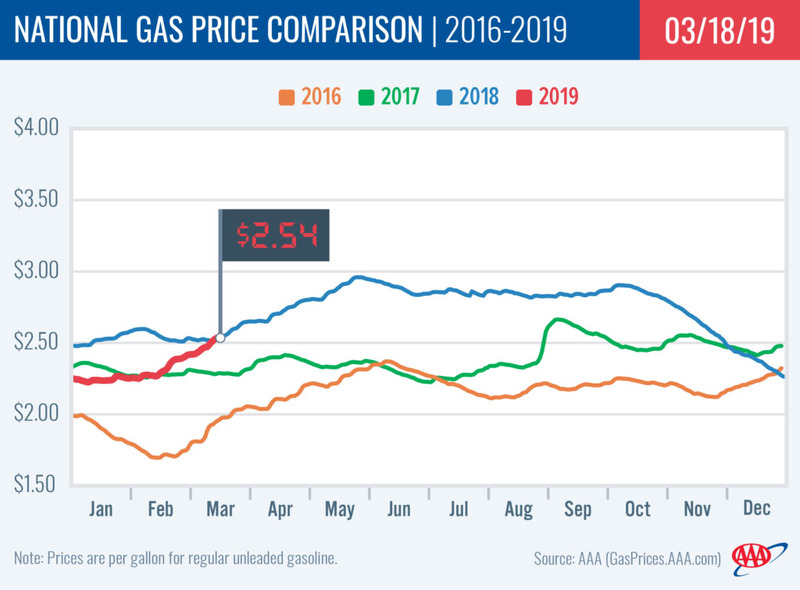 The fluctuating national and state gas price averages come alongside an increase in gasoline demand and reflect the higher crude oil prices as of late, but it’s likely not to be a long-term trend. Tampa, FL – At a penny more expensive on the week, the national gas price average ($2.25) increased for the first time since October. Despite the increase, today’s average is still cheaper month-over-month (-14 cents) and year-over-year (-28 cents). 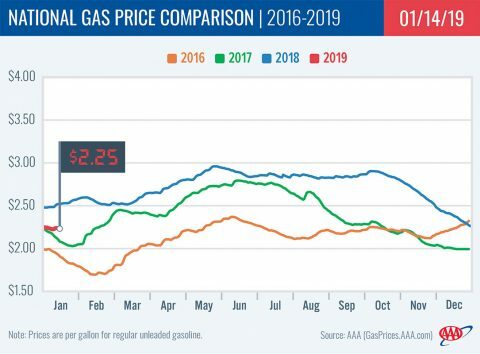 “The price of crude oil has been slowly, but steadily increasing since the beginning of the year, which is starting to push up pump prices,” said Jeanette Casselano, AAA spokesperson. 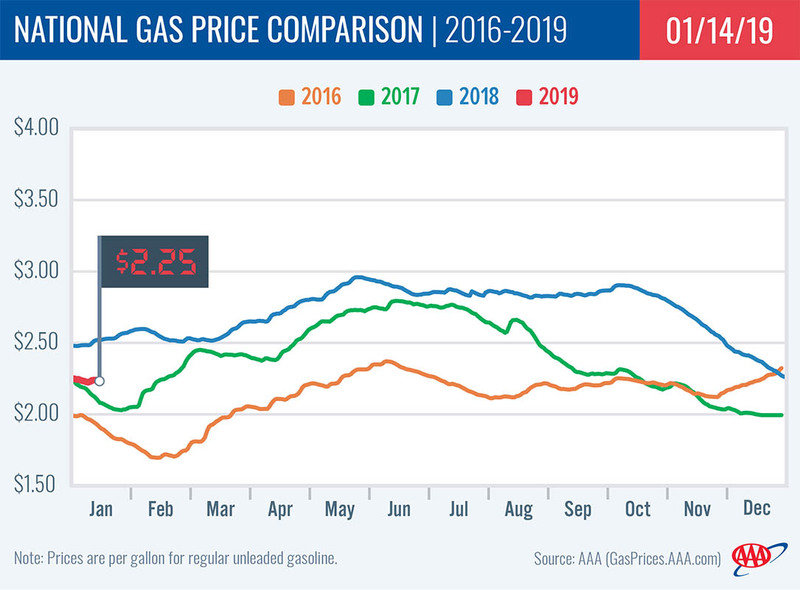 Nashville, TN – Tennessee Gas prices are holding steady right now, but face upward pressure, due to recent strength in the oil market and rising wholesale gasoline prices. The average price for gasoline in Tennessee is $2.01 per gallon, but should rise another 3-5 cents this week. Tennessee motorists are paying 1-cent more than a week ago. 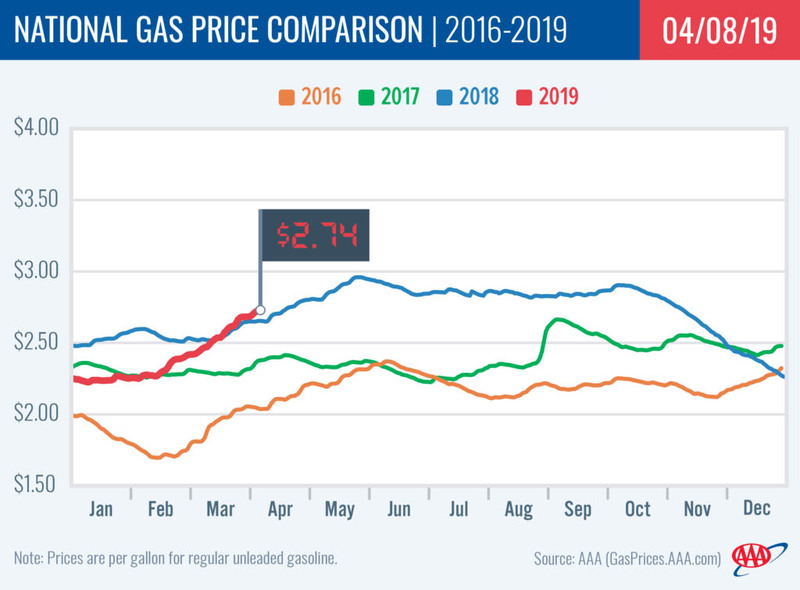 However, the average price is still 7 cents less than last month, and 35 cents less than this time last year. Despite the anticipated uptick, the state average remains 72 cents per gallon less than last year’s high, and 68 cents per gallon less than what Tennessee motorists paid in October. 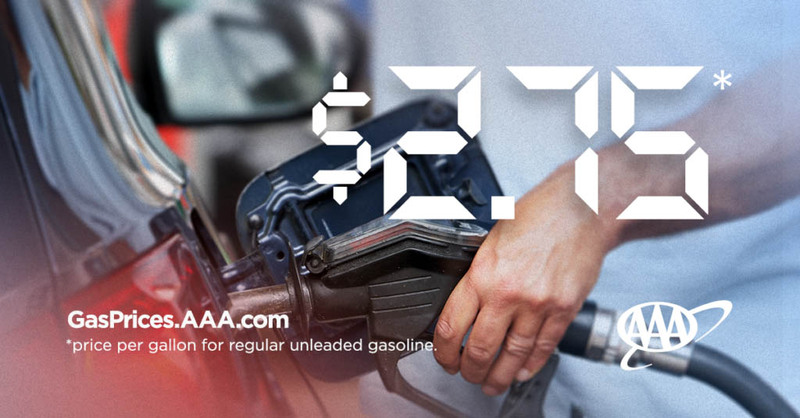 Nashville, TN – Gas prices are back on the rise, now that the oil market is regaining strength. Tennessee Gas prices increased 3 cents in the past four days. Sunday’s state average of $1.998 was just fractions of a cent from returning above $2.00 per gallon, for the first time since January 1st. 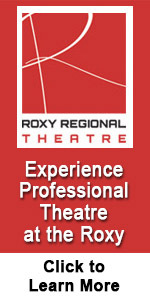 Click here to view today’s average price. Pump prices in Tennessee are now rising for the first time in more than 12 weeks.